While most of my woodworking projects are in the category of furniture, I have used my design and woodworking skills to construct a number of other projects, from small Williamsburg Knife Boxes to a full-sized redwood timber-frame shed. I have designed and built about a dozen various-sized and shaped tool boxes for carrying equipment to-and-from school. Generally, these are things used to carry or store other things, including shop tools and camera-projector equipment and cords for school and other presentations. Several of these box designs are used as student projects for practicing hand dovetail and mortise and tenon joints. The Shaker Chip Boxes with corner dovetails and steam-bent handles are very effective gifts. I’ve probably made 50 of these in various wood varieties. I use them for demonstrating different finishes - including French Polishing - on varying wood species. I’ve worked on a number of projects for outdoor uses. It is nice to have access to redwood (albeit becoming less available) as this is one of the best wood species for outdoor furniture. I find sawhorses to be a critical component of my woodworking shop. I have several pairs and they follow a long tradition of classic design. Many years ago, I found an early Fine Woodworking article by Sam Allen Sep/Oct 1980, No. 24. Here he described the classic sawhorse design, although it lacked much detail for shop construction. I've built these sawhorses using redwood, fir, and pine. Any material will work. I making available the detailed design package in PDF format that I created using SketchUp. This package includes full-size templates for the difficult angled saddle joints. This is a sturdy English bench of the Jacobean period. The original would have been in oak. Green Burial is a growing trend, and a proper coffin is required. I've designed this one based on viewing a televised funeral of Pope John Paul II. I could see an interesting taper in two directions from head to toe, and wanted that style. I designed this coffin based on my size, about 5ft. 7in. tall. I used pine and large dovetail corner joints. I finished with raw linseed oil only. In one of my visits to the Cabinetmakers Workshop in Williamsburg, I noticed a rather large stool among the workbenches. From a picture, I downsized the stool to provide a solid stepping stool in the kitchen. It is made of Monterey Pine and fastened with reproduction 18th century nails from Tremont Nail Company in Vermont. 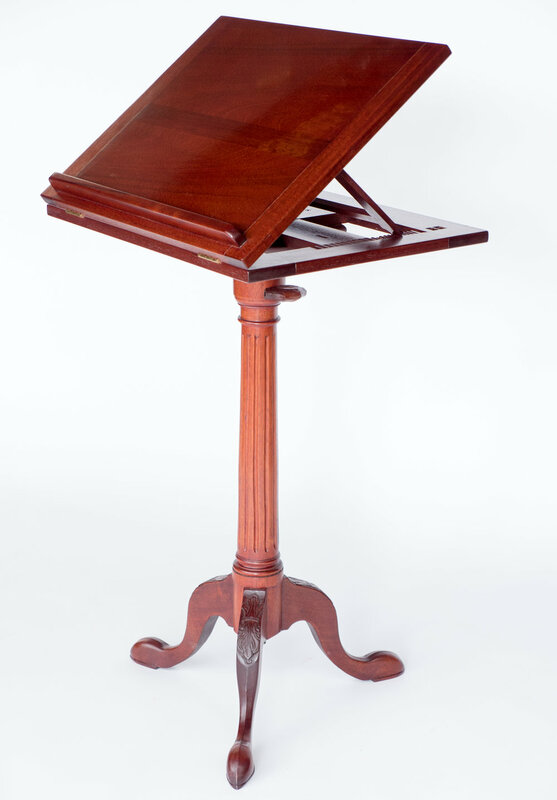 This Music Stand was a feature of an annual Williamsburg Conference, Working Wood in the 18th Century. The original was made in a Williamsburg Cabinet Shop in the 18th C. From pictures, I created a design in SketchUp. As in the original, my copy was made using Mahogany. The Top is hinged and adjustable with some ratcheted catches. The pedestal is on a tripod stand of carved cabriole legs. The height of the Top is also adjustable in height. On one of our visits to Colonial Williamsburg, I saw a small stool in a Kitchen of one of the Colonial Homes. I wanted to have one of those in my shop, so I took a picture that you can find in the download. I imported this picture (as a Photo Match) to SketchUp and began to reproduce the shapes and angles of the components. 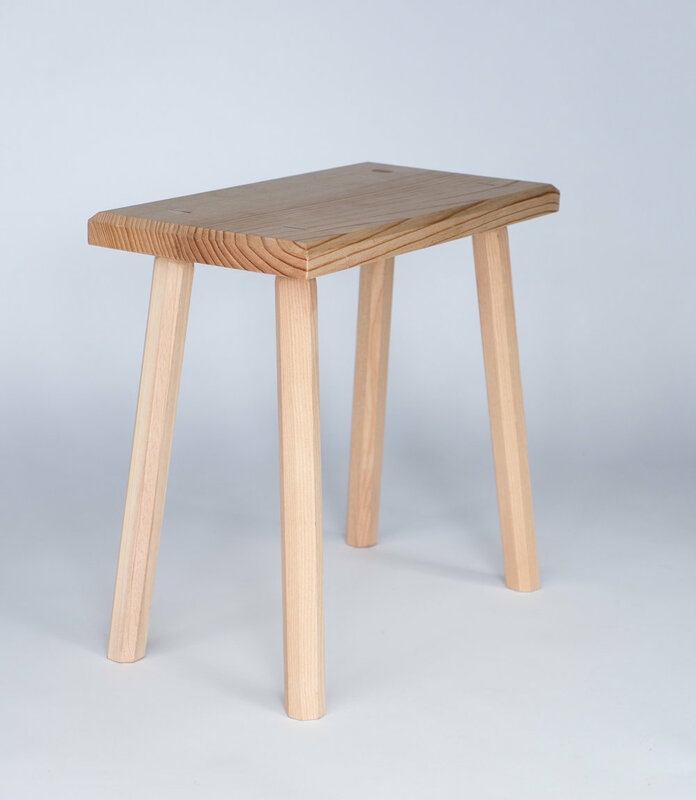 It is a simple stool without stretchers, and no turning required. It has become a very important feature in my shop. This is a very classic door construction with pinned through mortise & tenon joints. The Panels float in grooves in the Stiles and Rails. The inside edges of the stiles and rails are shaped with a thumbnail molding. There is no plywood in this door. The material I used is old growth Fir. It results in a heavy but solid door. During our family summer vacation, we unexpectedly had the opportunity to play lawn croquet. This occurred at a beautiful French Chateau surrounded by flat green mown lawn - perfect for the setup of the required wickets and posts. The quality of the croquet set - lightweight mallet heads, warped mallet handles, thin posts, and misshapen fragile wire wickets was disappointing. Nevertheless, we made the best of the equipment, and got into many competitive and lively games, including teenage grandchildren who haven't played before. Here in California, except for golf courses and perhaps local parks, we don't have green mown lawns, nor flat lots, so it is not so easy to find an acceptable location. Nevertheless, we were interested in finding a way that we can occasionally play the game. That meant a need for a Croquet Set. Naturally, there are many on-line sources for complete sets, and at very reasonable prices. However, I wanted to make a set, one that would be modeled on the top-of-the-line professional equipment. I needed detailed dimensional information and found The Croquet Association website helpful for designing mallets, balls, posts, and hoops (we called them wickets).